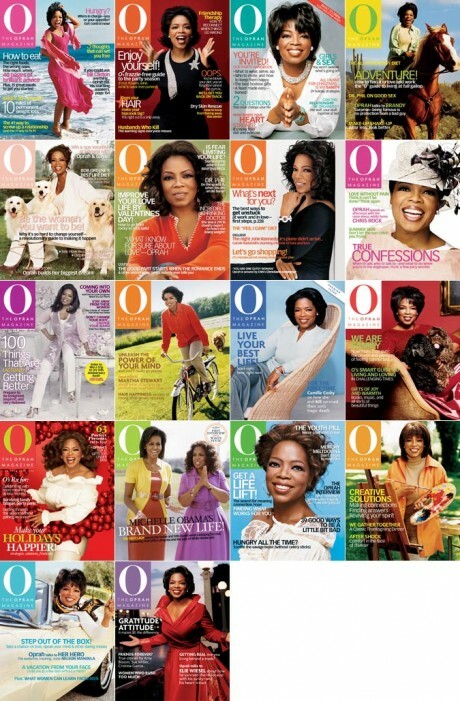 In honor of Oprah‘s retirement from her tv show, a collage of her personal magazine covers. Kari recently pointed out that every magazine featured her on the cover. This, to me, seems bizarre. It’s almost like a printed shrine to her greatness. What do you think? Is this a good use of the Oprah brand or is this a little narcissistic? This past week, Kari, Abby, and I left on a jet-plane and flew to Colorado. It was our first trip as a family. Leading up to the trip, we couldn’t wait to escape the approaching Texas heat and enjoy some crisp mountain air. In many ways, I think the anticipation of a vacation constitutes much of the joy of a trip. There’s something about leaving your home and taking in new and exciting vistas. It’s thrilling. Along with our anticipation of the trip, we also felt much trepidation at how Abby would do. Would she cry uncontrollably on the plane? Would she do well away from home for a few days? Early last Sunday morning, we loaded the car with two suitcases (to be checked), four carry-on bags, one stroller, and one car seat; we drove to Austin to catch our flight to Denver. Along the way, we learned some important lessons about traveling with a small child: one, always plan to stop more than you anticipate. We had to make two stops between Waco and Austin to take care of business, if you know what I mean. Two, just because everything will fit inside of an enormous suitcase, doesn’t mean it should. Our large suitcase topped the scales at 64 pounds — about 28% over the weight limit. Three, airport workers are quite amenable to people traveling with kiddos. The Southwest employees as well as the TSA folks were helpful and patient as we started our journey. After a quick lunch, we hopped on the plane to Denver. Abby did great. The weather, however, didn’t cooperate–the descent to Denver was the rockiest I have ever experienced. Lesson four: bumpy descents and pregnant wives make a terrible combo. While fanning her profusely with the provided barf-bag, we learned lesson five: bumpy descents are like baby-Ambien. Abby didn’t make a peep as she slept through the entire ordeal. Although Austin’s airport was very nice, Denver’s airport is probably the nicest I have been to. Large, open terminals and concourses. A fast, efficient tram to travel between terminals. We grabbed our six bags and continued on to pick up our rental car. Lesson six: workers at the rental care place seem shady and unhelpful. After reading me the riot act (also known as offering insurance), we picked out a white Camry as our vehicle. (Lesson seven: never buy a used car that was a rental.) After spending 20 minutes installing the car seat (sans base), we were on our way to Estes Park. Lesson eight: GPS’s are the most wonderful invention for wayfinding on vacation. Along the way, we picked up some supplies from perhaps the shadiest Walmart of all time and continued our trek into the mountains. The drive up the mountains and into the valley where Estes Park sits was breathtaking. Lesson nine: there is no substitute for the beauty of mountains. My biggest complaint about Texas is the lack of mountains within the state (and yes, I realize that Guadalupe Peak is classified as a mountain). We checked in to our cabin at the YMCA of the Rockies, unpacked, grabbed dinner, and crashed. Well, we crashed until 11:30pm–when the newness of our habitation got the best of Abby. Lesson ten: babies can turn a relaxing vacation into something less than relaxing in a heartbeat. After spending a good deal of the night up with her, we awoke Monday morning to red eyes and a desperate need of caffeine. 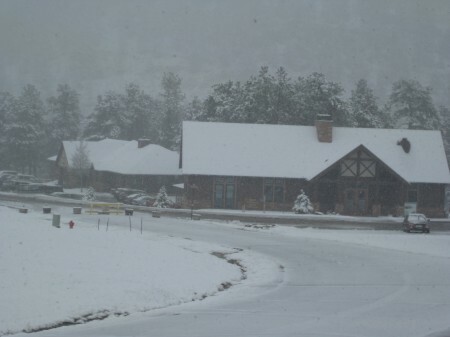 Much of the reason we were able to visit Estes Park revolved around a little known fact (and also lesson eleven): May in the Rocky Mountains is definitely off-season (both for travel and accommodations). On Monday morning, we drove into Rocky Mountain National Park. The weather was perfect (mid 50’s, dry, and calm); the drive, spectacular; we anxiously awaited hiking in the park. Arriving mid-morning, we discovered a little bit of snow on the trails. By little snow, I mean at least four feet of packed snow. Unfortunately we left our crampons at home (sarcasm), so we slid along the path for 100 feet to take in one vista. 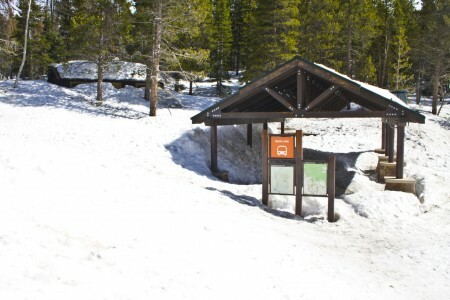 We raised the white flag and slid back to the car, lamenting that our planned hikes would not take place. In hindsight, this may not have mattered all that much as we were both sucking air after this short jaunt. Lesson twelve: high altitude plus low physical fitness make a terrible pairing. Even if the weather were perfect, our hiking would have been quite abbreviated. Lesson twelve: babies make you slow down more than anything else. 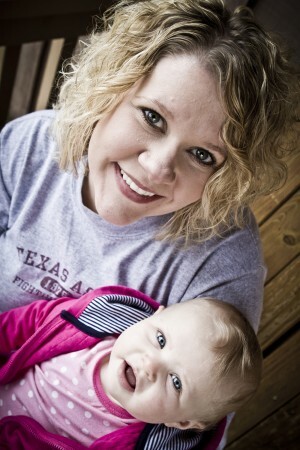 Although we wanted to go and do, Abby needed a nap in the afternoon, so we spent every afternoon in our cabin. It’s safe to say that she wasn’t the only one who napped during our afternoon respites. After nap-time on Monday, we hopped in the car and went to dinner at Poppy’s Casual Mountain Dining. 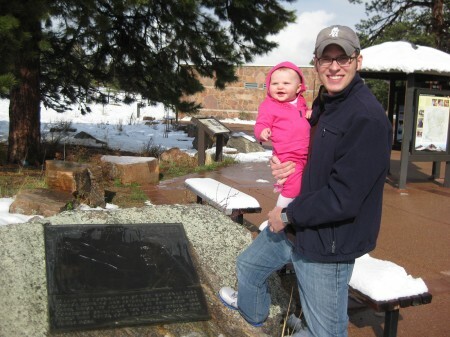 As a kid, Kari’s family traveled to Estes Park fairly often. This was one of their favorite stops, so we enjoyed dinner of pizza with scenic vistas of a fast-flowing mountain stream. After dinner, we strolled up and down the city’s downtown in search of dessert. Remember lesson eleven? That’s right, it’s off-season in Colorado, and the town rolled up it’s sidewalk at five o’clock. We found one open store: an ice cream shop, so we bought ice cream, and walked back to the car as we enjoyed the creamy delight. In some ways, it was madness as the brisk wind and chilly temperatures did not make it ice cream weather. But don’t worry about us too much, it was still worth it! As you can imagine, the storyline for our trip was much the same on Tuesday. Abby had a better night on Monday night, and we traveled back into the park in search of some snow-free trails. After a chat with the ranger, we learned there weren’t many snow-free trails (remember lesson eleven). 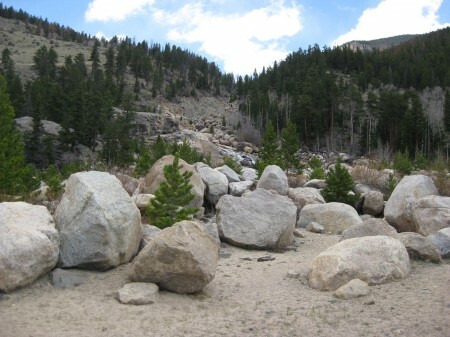 We chose to hike along an improved trail and see an alluvial fan, which was the site of a dam failure in 1982. By the time we arrived at our destination, clouds had formed and the wind picked up. The vista was breathtaking, and bundled up as best we could, we trudged along the path. I would be hard-pressed to explain the dichotomy that we felt. On the one hand, it was chilly and approaching miserable, but on the other hand, the beauty and wonder of the mountains made that disappear. It’s like you willingly take the discomfort because of the beauty. Lesson thirteen: being in the mountains makes bad weather bearable. Kari and I have a tradition to have one nice meal on vacation. Or perhaps I should put it this way: we had a tradition to have a nice meal on vacation. 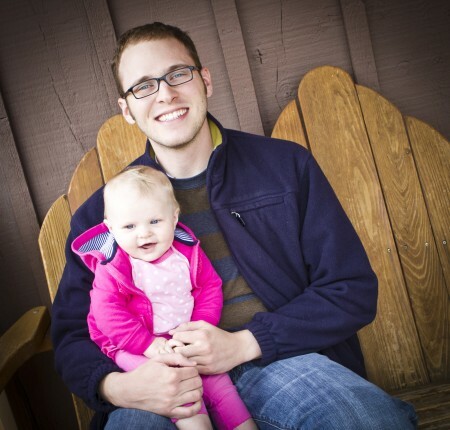 Lesson fourteen: babies don’t belong at nice restaurants. After attempting to corral one fussy kiddo for an entire meal at an expensive yet mediocre restaurant, I declared to the waiter: our timer is getting ready to expire–bring us the check. He chuckled and assisted us in our quick departure. At any rate, we won’t be taking family trips to nice restaurants for quite some time. After another good night of sleep, we were reminded of lesson eleven (you know the one about off-season in Colorad0). We woke up to a beautiful white landscape. That white fluffy stuff was everywhere. It was gorgeous. And cold. And we went back to bed. The snow continued unabated for most of the day, and by early afternoon, we were staring out at some 8″ inches of snow. Being from Texas, we were both panicked at the thought of driving, but as luck would have it: we were in Colorado. Lesson fifteen: snow plows and educated drivers make a big difference. Whereas Waco would shut down for a week if it snowed 8″, in Colorado the constant snow plow work left the roads clear and dry by the end of the day. The rest of the landscape was breathtaking. Kari said it looked like the mountains were dusted with powdered sugar. To combat our growing cabin fever, we hopped in the car, visited the park one last time to pick up souvenirs and see the plaque of Stephen Mather. Mather is widely considered the father of the National Park System. To commemorate his role in developing the parks, each one has a bronze plaque in his honor. We went back into town and ate at Peak to Peak American Grille. Kari had a burger and I had a chicken dish (yes, I still regret not ordering a burger), but dinner was great. On our way back to the cabin, we stopped by Safeway for the fourth time in four days to get some medicine and dessert. Lesson sixteen: dessert is a requisite after every meal on vacation. After downing our eclairs, we swore that we would be eating healthier food on future trips. This leads me to lesson seventeen: you can still eat too much on vacation. And yes, the medicine for Abby was our full-fledged acknowledgement that she had a cold. And yes, that meant another bad night for us. Lesson eighteen: traveling with sick children is miserable. My Thusday started at ten ’til two, and factoring in the time change meant my day effectively ended at midnight. By the time we left around 9:00am, snow had begun to fall again. 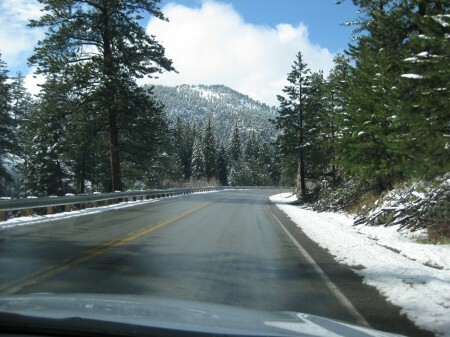 As we traversed through the mountains, the snow got heavier and heavier, but thankfully the roads were all clear. Before we knew it the snow turned into a cold rain that continued long after we left Denver. We avoided the 64 lb. bag controversy by repacking and after waiting in a long check-in line, we were at the terminal, eating McDonald’s and waiting for our flight. The plane sat on the tarmac empty for some time until we learned a connecting flight was late, and we were waiting on them before boarding. Thirty minutes later with one fussy baby (read: had a cold), we boarded the plane, hoping and praying that our return trip would be good. And once again, Abby did great. Lesson nineteen: babies can do a lot more than we often think. Arriving in Austin, we skirted I-35 on the new-fangled toll loop to avoid rush hour traffic. We trekked home in a rather uneventful fashion, arriving here in Hewitt just before dusk. Our first family vacation had come to a close. 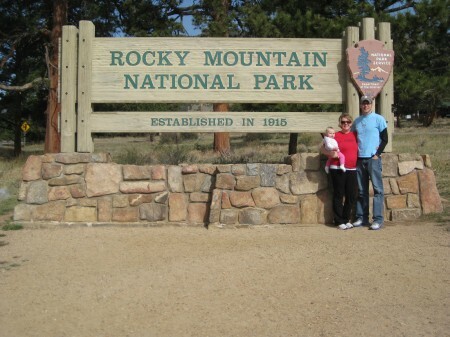 We were thrilled to go to Colorado and share that with Abby. It was a great trip with scenic vistas and beautiful clean air. We are already anticipating a return trip. Lesson twenty: sometimes the best things in life are the hardest things.Traveling with a baby is exceedingly hard. Between the extra bags (both luggage and eye accoutrements) and the difficulty of keeping up with another person, we may need a second vacation. But one of our overarching goals with our family is to do fun things together. I think it’s fair to say this is a good start. 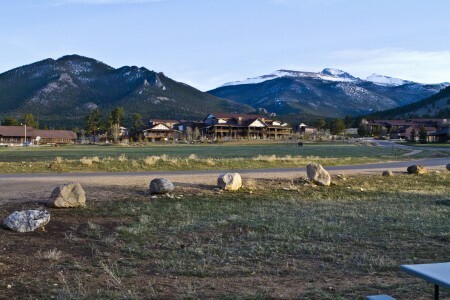 Next time, we’ll go during the summer and experience Estes Park during the on-season (see lesson eleven).